I cobbled this lesson together in a hurry when I heard that I would be away from the studio for a while. Did you notice the number of this lesson? Who says that you shouldn't tread lightly around Murphy and black cats??? There was no time to make sample bears for the techniques as I originally intended. Today we will make do with diagrams, and you will get to meet bears that have been living in my studio for about fifteen years. They graciously offered to be models for the techniques. Please make allowance for the dust they have gathered in time, and my early attempts at facial features! The bear with the blue waistcoat is the original Angus! One of the first patterns I ever produced, and after all these years still my favourite. The ballerina, clown and bee are variations on the Angus pattern. They were all string jointed. When bears are tiny, say less than 15cm (about 5 inches) tall, it is possible to string joint them rather than using split pin joints. 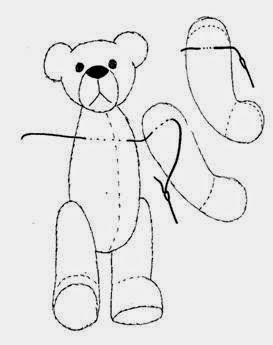 Although string joints are sturdy, it is not a good jointing method for teddies that will be played with. I prefer to string joint my very tiny bears. The thread running through the body of the bear pulls the arms and legs close to the body, giving the bear a nice compact look. On the left is Chloe. She was split pin jointed. You can see how the discs make the limbs stand away from the body. Although she's a little smaller than Angus, she appears much fatter. I believe the term thunder thighs is not inappropriate here! Angus is much more streamlined and compact. String jointing pulled his arms and legs snug to the body. A needle that is long enough to easily pass through the body of the bear. Sometimes I use my 9cm sculpting needle, but often I prefer to use a long darner because the needle is finer. Small sharp scissors. You should only use teddy bear floss or waxed upholstery thread for jointing your bears. Most dental floss these days is biodegradable. It will become brittle and disintegrate after a while. Where to place the joints? The joint position for string jointing is the same as for disc jointed bears. If the joints were indicated on the pattern, you can use the marks for string jointing. If there are no joint positions indicated, first hold the limbs to the bear in a ‘standing upright’ position and look at the bear from the side. The top of the arm and the top of the leg should be in the middle of the body, i.e. an equal amount of the back and tummy showing. Next, turn the limbs so that the bear is sitting. It should sit on its tummy, and on its legs. If necessary, adjust the position of the arms and legs. You can pin the arms and legs to the body. Thread a long needle with waxed thread. For string jointing we use a single strand of thread, and do not put a knot in the end. Run the thread through the bear’s body at the arm position, leaving a tail at least four fingers long. Take a stitch through the inside of the arm, scooping stuffing as you go through. Check that your needle goes through the arm parallel to the seam over the top of the arm. If your stitches are skew, the arm will turn in or out, and not lie neatly against the body. Put the needle through the body, try to stay as close to your original stitches through the body as possible, without snagging the tread inside the body. Sew through the second arm. Pull firmly on both ends of your thread and test the joint by turning the arms against the body. They should turn easily, but stay in position when you let go. If the jointing thread is too loose, you can sew through the body and arms again and pull tight as you go. Once the joint is tight enough, knot the thread ends together. Lose the thread ends through the body before snipping them off. Repeat for the legs. My book page for Lesson 12A.